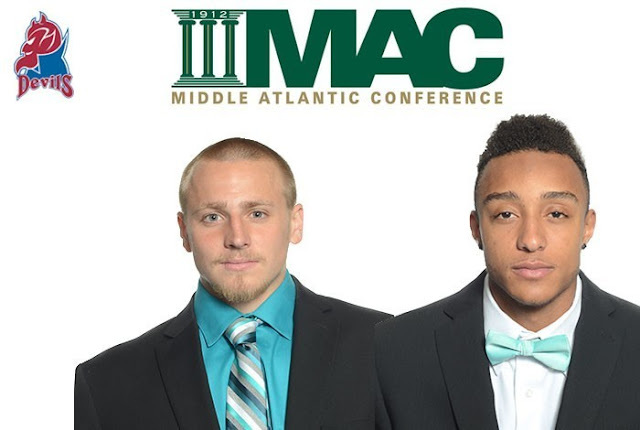 ANNVILLE, Pa. – After helping lead the FDU-Florham football team to a thrilling 40-38 victory over Misericordia University on Saturday, sophomore wide receiver Malik Pressley and junior tight end Joe LeBlanc each received Middle Atlantic Conference (MAC) Player of the Week awards on Sunday morning. Pressley, who set a school record with five touchdown receptions in the victory, was named MAC Offensive Player of the Week, while LeBlanc took home MAC Special Teams Player of the Week honors. The Devils (3-5, 2-5 MAC) have their most conference wins since 2005 and most total wins since 2008. Pressley earns the honor following another record-breaking performance. Since joining the Devils last season, the second-year wide out has tormented opposing defenses with his outstanding play. On Saturday, the reigning MAC Rookie of the Year went off for nine catches, 221 yards and the five touchdown receptions. Pressley now has 15 touchdown catches on the season, which is an FDU-Florham single-season record. LeBlanc's contribution on Saturday doesn't immediately jump out of the box score but the junior tight end played an integral part in the conference win. In the third quarter, LeBlanc alertly pounced on a muffed punt return by the Cougars, which setup a touchdown drive for the Devils. Then, after the Cougars pulled within two in the final minute, LeBlanc corralled their onside kick attempt, which finalized the victory. This is the second MAC Offensive Player of the Week Award for Pressley and first for LeBlanc this season. The Devils return to action next Saturday, November 7 when they travel to Chester, Pa. to take on Widener University.